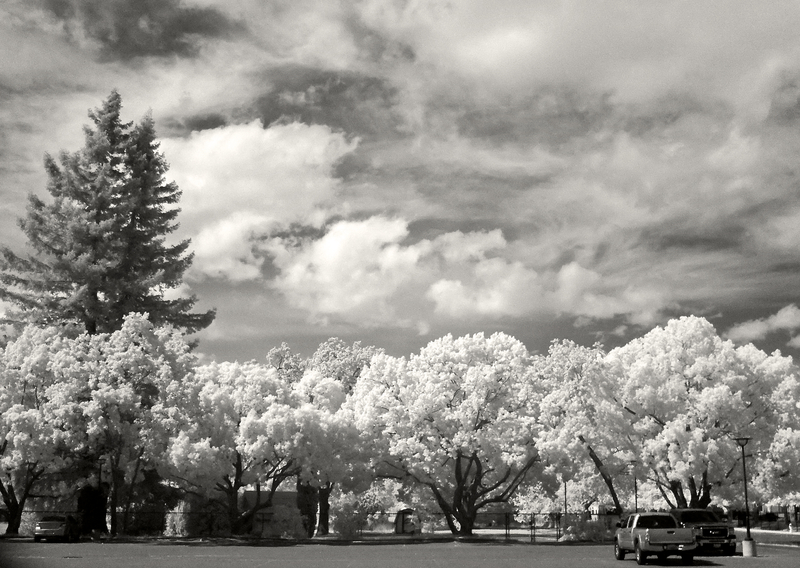 Latest Sensors Better for Infrared Photography? As I was watching clouds pass overhead this afternoon, I started thinking about the unique X-Trans camera sensor (that doesn't require a traditional low pass filter) in the Fujifilm X20, and how it might handle infrared photography. X-Trans technology is also found in the Fuji X100S, X-E1 and X-Pro1 models. And yes, those are the sort of things I think about on beautiful spring days. Anyway, I'm curious because I don't have any current cameras that perform well with the RM-72 Filter, and I had a good feeling about the X20. "Line of Trees" handheld with a Fujifilm X20 camera with Hoya RM72 filter. ISO 800, 1/20th at f/2.2, using the B&W simulation setting. Photo by Derrick Story. Click on image for a larger view.